It wasn't a good showing from the Patriots first stringers, who allowed Drew Brees and the Saints offense to march up and down the field, but Matt Patricia can at least take solace in an improved showing from first round pick Malcom Brown. It wasn't perfect, but the rookie was much more consistent this week after an up-and-down debut against Green Bay, with much of his action coming against the Saints first string offensive line. 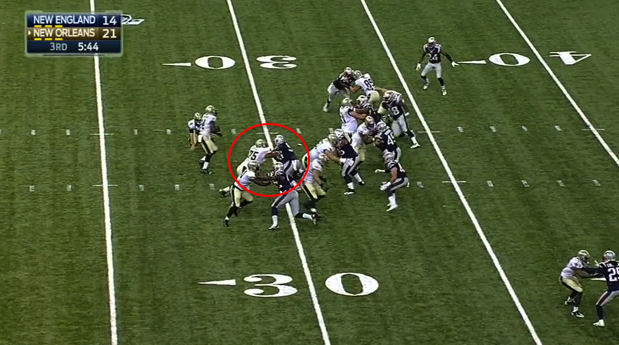 The Saints were able to throw the ball at will against the Pats first stringers (more on that later on), but Brown played a factor when they tried to run inside. That was evident on the Saints first running play of the game, as Brown's ability to get penetration (along with some excellent edge-setting by Chandler Jones) mucks up Mark Ingram's preferred path and allows Jonathan Freeny to corral him for a 2 yard loss. 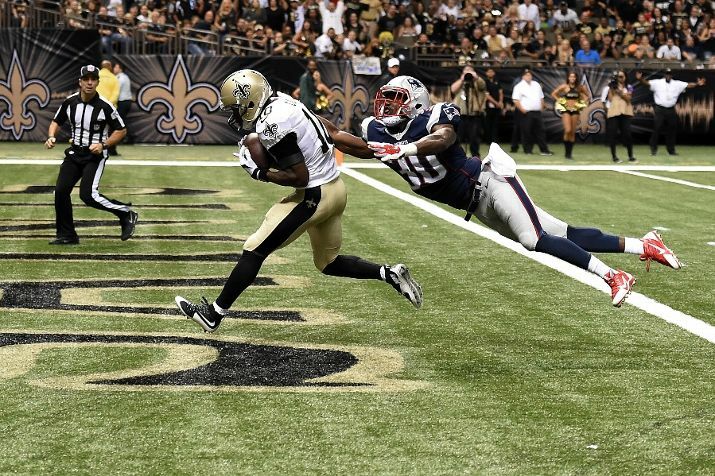 Brown showed up again on the goal line when the Saints tried to run right at him on a two point conversion attempt. While he did give up a little ground against the double team, he managed to anchor in front of the goal line. This creates enough traffic in the intended hole (much of that traffic being the two blockers attempting to move him) to allow the defense to stuff Khiry Robinson. There were other flashes (a 10:41 first quarter play which sees him use his quickness to split a double team) and a few down plays as well (12:31 in the first quarter sees him get driven back by a double), but the highlight play of night for Brown surprisingly did not come in the trenches. At the 8 minute mark in the first quarter, Brown shows good instincts in quickly recognizing a screen pass before flashing incredible athleticism and hustle by chasing down Robinson from behind. Before watching this play, remind yourself that Brown is listed at 320 pounds. It was interesting to see how the rotation played out around Brown, who looks locked in for a significant role as a rookie. New old face Casey Walker actually got the start and played the first series alongside Brown before rotating in-and-out throughout the game. Walker, who was unimpressive during his regular season stint with the Pats last year, did little to stand-out, good or bad, in his 29 snaps. After the first series, Walker came out for Sealver Siliga, who looked solid against the run in his 2015 preseason debut. It was somewhat surprising to see Siliga, considered by most to be a roster lock, out there late in the fourth quarter, and it's unclear whether that was a result of Bill Belichick trying to get him some extra reps to compensate for missed time or punishment for jumping offsides earlier in the game. Also of note was the status of veteran Antonio Johnson, an offseason program award winner who started the preseason opener against Green Bay. Johnson didn't enter the game until late in the third quarter, with Brown, Dominique Easley, Siliga, Alan Branch and Geneo Grissom all getting reps ahead of him. It's always dangerous to read too much into preseason rotations, but that can't be a good sign for a veteran with a teneous at-best hold on a job in a very competitive position group. This looked like the deepest group on the team last week against the Packers, and the edge guys continued to impress against the Saints despite Week One stars Rufus Johnson and Trey Flowers being inactive due to injury. Chandler Jones was dominant in his limited time on the field, and Jabaal Sheard continues to wreak havoc on opposing backfields, but the story of the game for this group was the extended time Dominique Easley saw on the edge. Easley is nominally a defensive tackle, but came out of college last year with a reputation for versatility after playing every position on the line at times during his career at Florida. He came in the second defensive series of the game as a defensive end and rotated back and forth between playing the edge and the interior throughout the rest of the game. At a listed 285 pounds, Easley is undersized for an interior lineman, and thus reliant on his explosive first step to win match-ups there. However, he packs a lot of power for an edge defender, which stood out on several effective pass rushes against the Saints tackles. A highlight for him came with 7:00 minutes to go in the second quarter, as he converted his power to the outside shoulder of starting left tackle Terron Amstead before getting inside him with a rip move, influencing an inaccurate third down throw that brings the punting unit onto the field. As I wrote last week, Easley is at his best when he can attack the outside shoulder (or "half a man"), and rushing the edge could put him in better positions to do just that. Unfortunately for Easley, it could be tough to find enough snaps for him on the edge. After years of having to rely heavily on the duo of Jones and Ninkovich to generate pressure, the Pats now find themselves in the pleasant dilemma of figuring out just how to utilize all of their talented pass rushers. Having a number of guys with the versatility to move inside and utilize their quickness and length against guards helps, and the Pats showed a glimpse of that on a first quarter third down play that saw both Jones and Easley line up inside, with Sheard and Ninkovich on the edge. The Saints managed to convert the third down thanks to poor tackling from Jamie Collins and Patrick Chung, but both Jones and Easley used their quickness effectively to get pressure and force a checkdown. Playcalling is still very vanilla in the preseason, but one can only imagine the kind of pressures Belichick and Patricia might dream up with the versatile defensive weapons at their disposal. The emergence of Easley as an edge option coupled with the drafting and effective early showings of Grissom and Flowers seemed to be pushing 2014 draftee Zach Moore squarely on the roster bubble. Moore didn't get into the game until midway through the third quarter, well after Grissom, and unlike last week, he played the vast majority of his reps outside on the edge. Many had assumed the bulked-up Moore was fit for an interior rushing role, but he looked better on the edge this week than he did inside against Green Bay. He got close on the pass rush several times, using his power to push his blocker back and compress the quarterback's pocket, and also displayed fantastic technique on this third quarter run stop. There's no way around it: this was a subpar showing from Jamie Collins. Collins was only on the field for two series, but in that time he managed to: trail Mark Ingram badly on a wheel route, miss a tackle on a third-down dump off that resulted in a first down conversion, get stiff armed out of a play on the edge (he can thank Malcolm Butler for making a fantastic tackle on that play), get absolutely blasted four yards back by a blocker on another edge run, and badly misplay that aforementioned screen that Brown wound up running down. We all know that Collins is a much better player than what he showed, so lets hope he got all of his bad football out of his system that night. It was a better night for James Morris, who has been solid if unspectacular in both preseason efforts. Morris brings good physicality and toughness against the run, and he made one of the defensive plays of the night with his effort chasing down receiver Josh Morgan and punching the ball loose after a long gain. 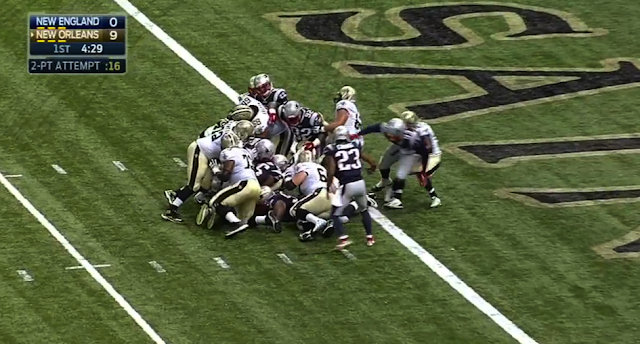 That turnover was a huge play in the Patriots second-half comeback. Jonathan Freeny had one of the lowlights of night, as he gave up inside position and allowed Ben Watson to run right past him for an easy touchdown. A teaching moment for him, but not encouraging given that his range and athleticism are supposed to be his strengths. He did have some solid moments against the run, but appeared to take a step back overall from his showing in the opener against Green Bay. Finally, Darius Fleming made his 2015 preseason debut after missing the opener with an injury. The former fifth round pick is clearly behind Freeny and Morris in the battle for depth spots behind presumed starters Collins, Dont'a Hightower and Jerod Mayo, but showed some positive things when he finally got in, including an impressive job sifting through traffic to pick up a run stop at the 11:55 mark of the fourth quarter. Just a brutal day for the Patriots secondary. There's not much else to say when you allow opposing quarterbacks to complete 25-37 attempts for a whopping 10.1 yards per completion. Much of the post game attention was directed at Devin McCourty, who started at right corner and looked like a guy who hadn't played corner in two and a half years. 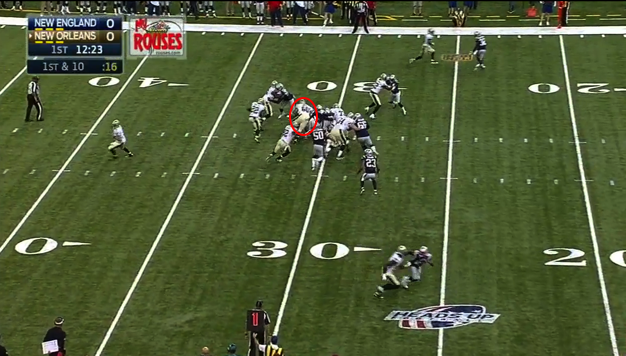 Brees picked on McCourty early and often, with Brandin Cooks being the primary beneficiary. Matt Chatham made a good point during the game broadcast that while McCourty has played his fair share of man coverage over the past two years, it's largely been in specific matchups with tight ends and bigger receivers. The explosive quickness of Cooks clearly gave McCourty trouble, and the cushion he was forced to give him to compensate made him an easy target. Despite his post-game comments, McCourty shouldn't carry all of the responsibility for Cooks' 45 yard touchdown. It appeared that Duron Harmon, who was playing McCourty's customary deep centerfield role, simply didn't allow enough cushion himself to account for just how damn fast Cooks is. Recognizing Cooks' route a split-second earlier likely allows Harmon to get himself in better position to get there and contest that deep ball better. Harmon did show up earlier with a nice play, landing a big hit on Ben Watson in the end zone to prevent another would be touchdown. Another guy who got repeatedly victimized was Logan Ryan. One week after getting burned on a 26 yard touchdown against Green Bay, Ryan gave up plays of 36 and 28 yards to Cooks and Josh Morgan respectively. Ryan did have a pass breakup in the end zone (albeit on a poorly thrown ball) and still appears to have solid ball skills when he can stick with his receiver. However, he doesn't seem to have the recovery speed to get back into the play once he gets beat at the line. He'll have to show improvement quickly, as Tarell Brown and Robert McClain appear poised to take the lions share of the snaps next to Malcolm Butler once the regular season starts. Speaking of Butler, he was a lone bright spot for the secondary early on. While he wasn't targeted by Brees, he still made his presence felt in his brief time on the field. 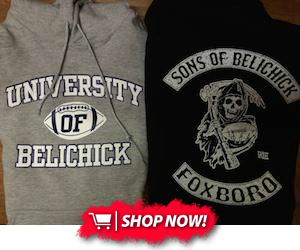 Belichick will love the aggression he showed knifing through traffic to take down Khiry Robinson on the edge, and he appeared to be doing his best to give the defense a spark with his physical takedown of Cooks on an end-around. While Butler showed well early, Bradley Fletcher made his case late in the contest. Like Logan Ryan, Fletcher allowed only two of his five targets to be completed, with a pass break up in the end zone. Unlike him, he only allowed 8 yards on those two receptions, and added another pass defensed to boot. It's worth noting that the bulk of his playing time came against Saints backups, including fourth string rookie quarterback Garrett Grayson, but you can only beat who you line up against. We'll see if he gets more playing time this week against Carolina.